Interesource Group (Ireland) Limited is proud and excited to form a strategic fundraising alliance with Blood Bike Mid-West, a charitable organisation that provides free emergency transport to the HSE, private hospitals, clinics and hospices. 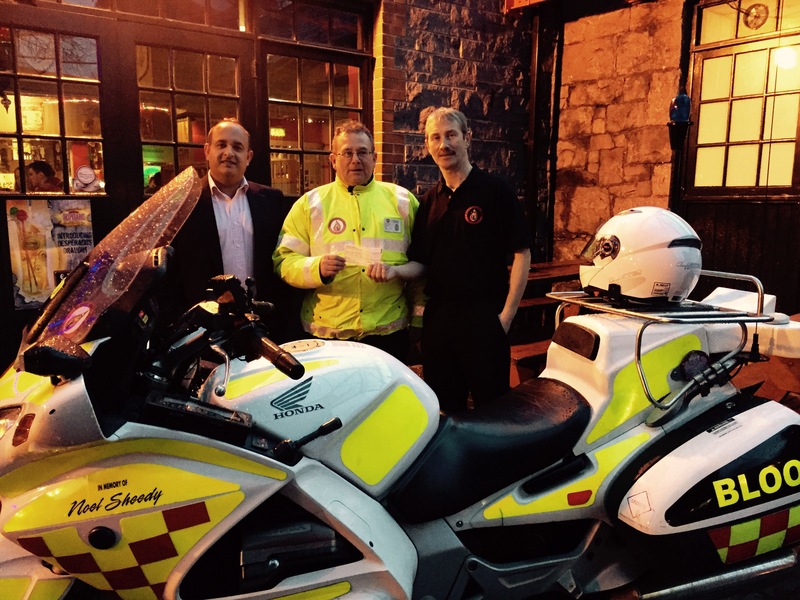 Based in Limerick, its motorbike volunteers operate from 7pm through the night providing a nationwide delivery of breast milk, blood, drugs and any other emergency medical products between one hospital and another. Haaris Sheikh, Chief Executive of Interesource Group (Ireland) Limited has been a supporter of charitable organisations in Ireland and has been involved in fundraising campaigns for St. Vincent’s Lisnagry, Stroke Support Club Limerick and the Deaf Community Centre. Interesource Group has already sponsored some of the Blood Bike Mid-West operational activities, but when John Sheedy, Director of BBMW told his story of how he became involved in BBMW, Haaris could not resist getting involved. John told Haaris over a cup of coffee overlooking Lough Derg in Killaloe that his son Noel was only seven. He said “he was perfect, full of life and fun, blonde hair and into sport in a big way. My wife spotted this little mark at the back of his ear and the doctors had him in hospital within minutes. While the doctors, our own GP and nurses in the hospital did all that they could, Noel was in a coma within four hours. There was a special drug for meningitis but it was held in Dublin and the hospital had to get it down. They did it as fast as they could but it was too late for Noel. Often, good inventions come from identifying a very specific need. BBMW did just that. It is a unique service and like so many great causes – is not funded. The costs of operating and acquiring the bikes, the fuel cost and of course the volunteers’ time is managed by fundraising and donations. Haaris says: “In 2015, I along with my team will be contacting suppliers, supporters, friends and business associates to encourage people to work with me, donate, help in fundraising or run an event from which proceeds can go to BBMW. It’s a worthy cause. Even if we have volunteers who can ride the bikes, someone still has to pay for the fuel and maintenance – so every euro helps towards getting the bikes on the road”. Celebrating the start of Interesource Group’s alliance with BBMW is marked with the presentation of a cheque for €1000.00 from Declan Collins (General Manager) of The Stables Club, (University of Limerick) where Haaris is director of HR.